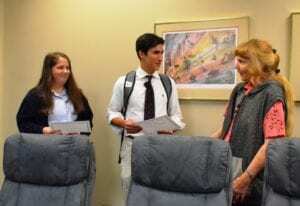 For the 6th consecutive year, the Remmert Family Memorial Scholarship has been presented to St. Benedict students. This year’s recipients are juniors Dante Carrasco and Marisa Mata. 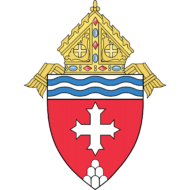 Students with a 3.0 GPA or above compete for the scholarship by submitting applications, reference letters and essays to the Superintendent of Catholic Schools. From these, prospective recipients are asked to highlight early career interests in a number of key areas. Other relevant factors, such as faith and service, are also considered in the selection of the award recipients. 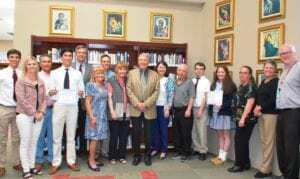 At today’s presentation, Dante and Marisa were joined by their parents and siblings, members of the Remmert family, the Superintendent of Catholic Schools and SBA Administration.